The decisions you make here will impact things like Reporting and Admin Rights, as well as Content Management, Branding, and Enrollment Rules for learners. If you plan to create your user accounts via a feed from your HRIS or payroll system, then it will be difficult to make changes down the road without impacting your integrations and processes. It’s very important to get this right the first time or you may find yourself spending extra time and money to redo pieces of your integrations, or getting frustrated with how you end up working with user data in the system, post-implementation. Most LMS platforms provide a way to organize users into Departments – think ‘nested folders’ as displayed on a typical Org. Chart – e.g. Sales, Marketing, Development, Warehouse, etc. This is usually a perfectly acceptable way to organize your learners, provided you have a very formal user hierarchy. This often means that a user will only exist in one Department or Sub-Department and the relationship between managers and employees tends to map directly to the Department structure. Sometimes, Department structure isn’t enough. Some organizations have very complex or dynamic employee taxonomies. A rigid Department hierarchy in this case simply won’t work. As an example, I was recently speaking with a new client about how they run their business. They work in a dealership model and management needs to run training reports and set enrollment rules by a variety of criteria including Region, Product Line, Dealer Name, and Dealer Type. The internal client Sales Managers may be responsible for sales of one or more product lines across one or more regions or dealer types. In this case, we need a more flexible way to organize the users as each learner may exist in more than one region (the regions overlap depending on the dealer and product), and sell more than one product line. Confused yet? But of course, to our customer, this makes perfect sense and is simply how they do business. In this case, we would not expect them to change their business processes in order to work with a very rigid Department hierarchy. Enter “Groups” to the rescue! Groups provide a way to organize users based on common properties such as Job Title, Location, Product Line, etc. Groups can be static (pick and choose the members) or automatic (set the rules and membership will be dynamically adjusted as user’s information is updated). Groups cut across the Department structure, and a user can belong to multiple Groups. The Group Rules can be based on any combination of Standard and Custom Fields, giving you complete flexibility for mapping in data from your HRIS, CRM or virtually any other system. The combination of Departments and Groups in Absorb LMS allow you to fully control who sees what, and who can do what to whom. A bit of work and careful planning up front will significantly increase your satisfaction and productivity with your LMS in the long run! This example of Department and Group User Management perfectly illustrates one of the 3 most important LMS features, flexibility. 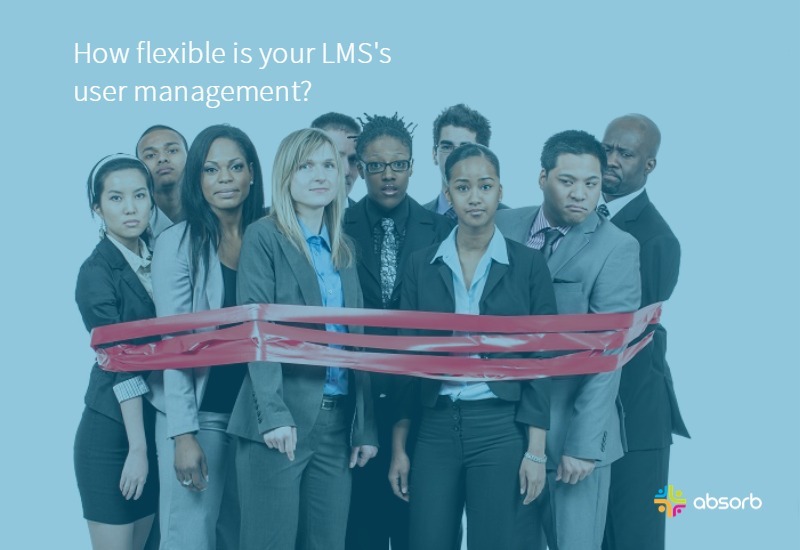 Download our free guide to see the other two features your LMS needs to have.